In 2015, Australia attracted a little over 600,000 international students, most of them from non-English speaking countries like China, South Korea, India, Malaysia and Saudi Arabia. While these students dream of working here after their education and improve their standard of living, a little matter of academic assignments become a barrier to their dreams. Most of our universities carry this biased notion that students who can write fluently in English will be equipped to handle real life challenges in their corporate lives. Nothing can be farther from truth. Expat communities from China, South Korea and India are one of the most prosperous communities in Australia despite their limited English skills. Unfortunately, the fact that hard work and talent overshadows English skills has not dawned on our educational system which continues to use the age old system of giving essays or projects to test its students. Frustrated by such an unfair system, many students seek assistance on their assignments so that they can retain their scholarships and pursue their dreams. MyAssignmentExpert.com has been providing reliable help to the students since 2010 and is regarded as one of the most trusted online assignment help provider. We assist thousands of students every year and more than 70% of them (one of the highest customer retention levels in this industry) come back to us again because of the quality of service we provide. We make realistic promises and go to extreme lengths to make sure we meet them. How can MyAssignmentExpert.com help students? Assignment preparation: If you have an assignment due and you have no idea how to proceed, just contact us and one of our experts will be glad to assist you at a very nominal fee (starts at 25 AUD per page). Paraphrasing: If you have a sample assignment which you want us to simply reword (no new research) to avoid plagiarism, you can avail our paraphrasing services at a nominal price (starts at 15 AUD per page). NEW: Now you can chat with one of our in-house editors and get FREE assignment/dissertation consultation for 30 minutes (no strings attached). 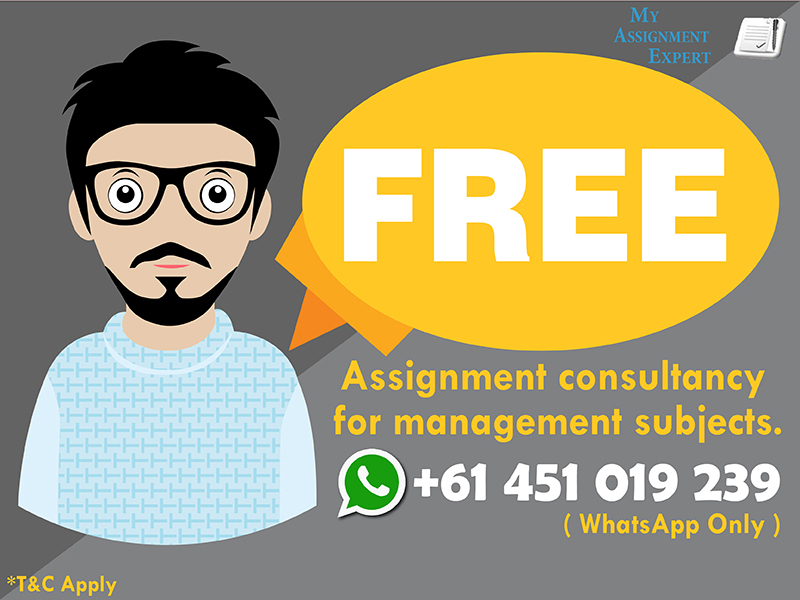 Add us on WhatsApp (+61 451 019 239) now and start clearing any doubts regarding your assignment. T&C apply. Why is MyAssignmentExpert.com better than other online assignment help websites? We are aware that there are a lot of websites that take your money and provide rubbish leaving you in the lurch when your deadline is approaching. It is our endeavour to spread awareness among students so that they make the right choice. After all, your grades and your future depend upon the quality of assignment help service you choose. Probably a few months old: Their modus operandi: Build a website, make tall and unrealistic claims, offer rock-bottom prices to attract gullible students, deliver rubbish, close the website after a few months and start again. They are fly-by-night operators and have little incentive to protect their reputations. In this process, it is the students who suffer as they lose a lot of money and often have to repeat their courses. Hint: The next time you see a website offering you Harvard graduate writers at $9.95/page, you know where to run. Trusted assignment service provider since 2010: We take assignment writing business very professionally. We hire good writers, offer realistic prices and provide unmatched after-sales service (reworks or refunds) till you are satisfied. After all, we have a reputation to protect. Most of our business comes from repeat customers and we understand the importance of customer loyalty. Instant quote: These websites know that students are in a hurry to place their orders. In a bid to be the fastest to accept orders, they develop an instant quote system where their websites will tell you the prices you have to pay even before someone has actually looked at your requirements. It does not matter whether it is a simple 1000 word diary entry or a complex 1000 word literature review, they will show you the same price. Hint: Do not get tempted to make payment when you see an instant price flashing on some random website. Do a thorough background check and ascertain whether their team actually understands your requirements. We give a quote only after we have understood your requirements: When you submit your requirements to us, we forward it to one of our in-house editors who evaluates the difficulty level, extent of research required, time available etc. Only when we are sure that we can meet your requirements satisfactorily, we give you a custom quote. This process takes us 1-6 hours. What’s more: Unlike other websites, we don’t push you to make the payment immediately. We want you to evaluate different options and take the decision which you feel is in your best interest. Accept everything that comes to them:Most websites will not take a look at your actual requirements before accepting your payment. In the process, they accept anything and everything that comes their way even if they do not have the necessary expertise. At the end, you will either get a last minute cancellation or worse, a rubbish assignment which will definitely make you fail your course. Hint: Beware of websites which accept ALL the subjects as they are unlikely to give your assignments the attention they deserve. We accept only those assignments which we can satisfactorily deliver: We turn down any assignment request which we feel are unreasonable or in which we don’t possess expertise. So if you are looking for a website to do your assignment of 3000 words in a couple of hours, we may not be the right website for you. Over time, we have developed core competency in various subjects like Management (Marketing, HR, Strategy, Finance, etc. ), Law, Nursing, Psychology, etc. Most of our experts come from these domains and we are confident of helping you with these. No quality check is done: Most of these websites do not have a quality check process in place. Once you place an order these websites, you will have no idea of what is going on until the last minute. These websites will submit whatever is done by their writer without someone going through them. By this time, you will probably have no time left to ask for reworks or change it yourself. Even if you contact their customer care, they will take ages to reply simply because no one has bothered to read the assignment in the first place. Two stage quality check:At MyAssignemntExpert.com, we have a comprehensive two-stage quality check process for all the assignments. During the first stage, an in-house editor reviews the submission done by the writer using a standard checklist. Once the content is approved, we do a plagiarism check using WriteCheck during the second stage. This makes sure that each sentence in your assignment is written exclusively for you. No after sales service: Most of these websites consider that their work is done once they submit the assignment irrespective of the quality of the paper they submit. We have heard from students how other websites absolutely refuse to do reworks or charge a hefty fee even if it was their fault at the first place. They don’t bother to answer their customers’ emails asking for clarifications either. Hint: Review the website’s rework and refund policies in detail before you place the order. You get support till you are satisfied: At MyAssignmentExpert.com, you will get assistance from us till you are completely satisfied with your paper.Want us to rewrite a portion of the paper? Want a clarification on your assignment? Want a plagiarism check report?No problem, we are here to assist you till you are completely satisfied. We understand that our commitment extends till you are completely satisfied with your purchase. If you feel any deficiency in our service, you can find support in our customer friendly rework or refund policies. Inconsistent quality: The end result of using such websites is that you will get substandard assignments even after paying a lot of money with no facility for redressal. Hint: Check the website’s reputation with your friends and seniors before you choose an assignment writing website. Quality comes first with MyAssignmentExpert.com: At MyAssignmentExpert.com, you can be assured that you will get consistently good quality which you can rely upon to pass your course. Even if we fail to meet your expectations in those rarest of cases, we will provide you support in the form of complete reworks or even a refund. T&C apply. How do I trust you that you will meet your promises? We have been a reputable assignment service provider in Australia since 2010. You can check some of the sample assignments on our website or check with your friends/seniors who might have used our services before. If you want to maintain confidentiality, you can chat with one of our in-house editors on WhatsApp (+61 451 019 239). Our editor will guide you on how you can proceed with your assignment and clear any doubt you may have before you make the payment. Remember that this is a chance for you to review the skills of our team members. You can ask us any number of questions to see if we can really do justice to your assignment requirements. You do not have an obligation to make a purchase if you don’t feel confident at any time. We won’t push you either, we promise! Okay, I am convinced that MyAssignmentExpert.com is a trusted assignment help website. How do I place an order? Placing an order with MyAssignmentExpert.com is very simple. Fill our online form or send us your requirements via WhatsApp (+61 451 019 239) or email ([email protected]). Make sure you mention the name of the subject, the exact topic, word/page limit, marking criteria (if any), relevant resources (if any) and deadline when you place the request. We will revert with our quote in 1-6 hours. If we are not sure of meeting your requirements, we will say so. But if we do accept your request, we can assure you that you will be glad that you finally found a reliable assignment writing website.